Letters can have many styles. Everyone has his or her own style. Some you like, some you don't. Wrapping is another wiring style. 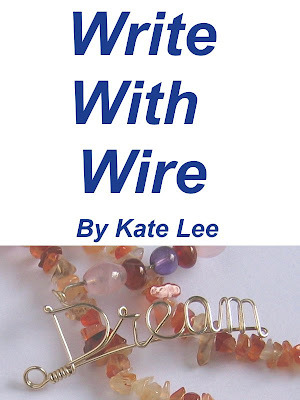 You can add some wire wrapping to your writing. There is a simple rule that combining what you've learnt can create some new things. Make the letter first and then wrap it. All you need is one piece of wire, thus you can limit the number of wire ends to 2. The less ends, the better. The ends of the D are both at the bottom. One is covered by the other. The benefit is not only to give a style but to strengthen the letter. The ear hook is for comparing size. Wrapping is categorized in variations so it's not included in the ebook.